Synchronous behavior signifies that two or more systems operate or occur at the same time and space. Then, the synchronization problem is to induce the synchronous behavior in two or more dynamical systems. Thus, as a consequence, the synchronizability is defined as the property of dynamical systems such that the synchronous behavior can be induced on two or more dynamical systems. Such a problem can be understood as the interconnection of two or more chaotic systems in such manner that they behave in synchronous way. 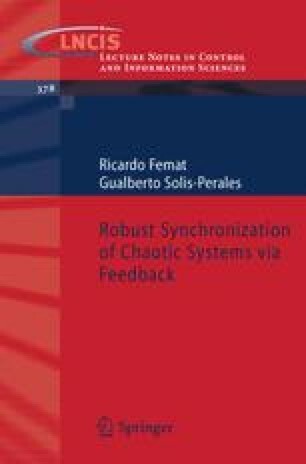 The synchronization can be performed by feedforward or feedback interconnections , . In this sense synchronization problem is a control one; since synchronizability is related to the intrinsic properties of nonlinear systems to be synchronized, and such properties can be studied by exploiting the control theory concepts; controllability and observability.